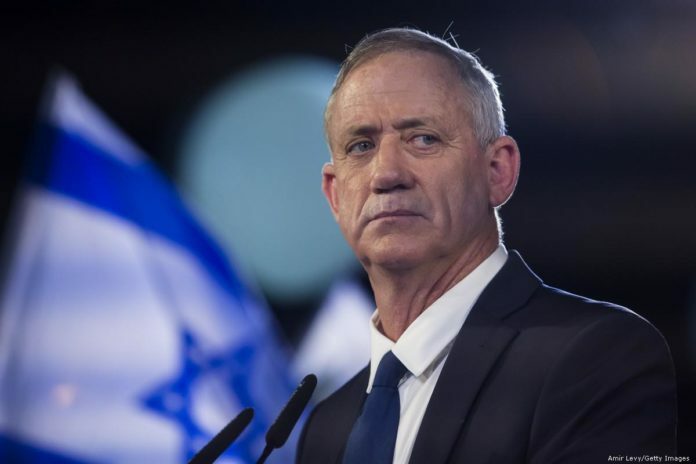 Former military chief Benny Gantz has burst onto Israel’s political scene as the great hope of the country’s shrinking “peace camp” with a message that is anything but dovish. The retired general, who wants to topple Prime Minister Benjamin Netanyahu in April 9 elections, boasts of killing Palestinian militants and aligns himself with political hard-liners. He fires back at Netanyahu’s criticism with scathing counterattacks. In today’s Israel, Gantz’s ready-to-rumble rhetoric appears to be the only way to bring down the long-serving Netanyahu. That’s turning him into an unlikely source of hope for Israelis who view ending their country’s rule over the Palestinians, now in its 51st year, as a priority. Yossi Beilin, an architect of the 1993 interim peace accords with the Palestinians, said fear of another Netanyahu term is driving much of the support for Gantz. He called Gantz a “black dove” — an imperfect but tolerable alternative to Netanyahu. “Not that I agree with everything he says, but many of the things he is saying are OK from my point of view,” Beilin said. Opinion polls forecast victory for Netanyahu’s Likud Party. But since Gantz’s recent maiden political speech, his new “Israel Resilience” party has emerged as No. 2. The race could swing in the challenger’s favor. Netanyahu faces possible indictment in a series of corruption investigations, perhaps before the elections. Meanwhile, Gantz is reportedly exploring mergers with other centrist parties. Gantz appears to be modeling himself after Ehud Barak and the late Yitzhak Rabin — former military chiefs-turned-prime ministers. Both used military credentials to lead security-obsessed Israel to peace negotiations with the Palestinians. Wary of being branded a “leftist,” considered a put-down by many Israelis, Gantz has said little about his vision of peace with the Palestinians. He dresses his rhetoric in security terms as he tries to win support from Netanyahu’s nationalist base. In his January speech, Gantz bragged about assassinating Ahmed Jabari, a former Hamas military commander whose death in an Israeli airstrike in the Gaza Strip sparked an eight-day war in 2012. “The heads of the terrorist organizations need to know that Ahmed Jabari was not the first, nor may he be the last,” Gantz warned. Without giving details, he vowed to “strive for peace” and — if that is impossible — to shape a “new reality.” He said he’d strengthen West Bank settlement blocs and retain control of the Jordan Valley, a strategic section of the occupied West Bank the Palestinians seek as the heartland of a future state. A TV ad for Gantz’s party shows aerial footage of the airstrike on Jabari’s vehicle. A second ad shows images of Hamas funerals and boasts of killing 1,364 “terrorists” in the 2014 Israel-Hamas war. The United Nations has said about two-thirds of more than 2,100 Palestinians killed in the 2014 war were civilians. Among the dead were many civilians killed in airstrikes on homes where Israel suspected or determined militants to be hiding. A U.N. report has said Israel’s actions may have amounted to war crimes. Gantz and Israel’s then-air force chief are being sued by a Palestinian family in a Dutch court. Gantz’s campaign and the military referred questions to Israel’s Justice Ministry, which did not respond to a request for comment. In Israel, the 2014 Gaza war is generally seen as having dealt a blow to Hamas, and Gantz’s military record an electoral asset. Driving home the point, he appointed Moshe Yaalon, another former military chief with hard-line political views, as his deputy. Opinion polls show Gantz neck and neck with Netanyahu when it comes to fitness for prime minister and handling security. About one quarter of Gantz’s supporters formerly backed Likud or the allied Kulanu party. Political scientist Reuven Hazan said Gantz’s tactics cater to widely held views among Israelis that internationally recognized Palestinian President Mahmoud Abbas is too weak to deliver results and that Gaza’s Hamas is a terrorist group. Israel’s electorate is mostly divided between the right wing that wants to preserve the status quo, a smaller “extreme right” that wants to annex occupied lands, and the center, which wants to find some sort of way to change the situation, Hazan said. “Those who clearly stand up and say ‘two-state solution, we have to uproot settlements,’ they’re not winning elections in Israel these days,” he added. During Netanyahu’s decade in power, the chasm between him and Abbas has paralyzed peace efforts. Netanyahu has largely ignored the Palestinians and instead courted Sunni Arab leaders, based on a shared enmity toward Iran. Gantz told Yediot Ahronot he wants to end Israeli rule over the Palestinians. “We need to find a way in which we’re not controlling other people,” he said and also praised the “painful but good manner” of Israel’s 2005 pullout from the Gaza Strip, hinting he might consider similar steps in the West Bank. Netanyahu’s Likud and others immediately branded Gantz a “leftist” who would uproot settlements. Gantz quickly clarified there would be no “unilateral decision” about removing settlements. He noted that Netanyahu as a Cabinet minister in the early 2000s voted in favor of the Gaza withdrawal, though he later resigned in protest. More recently, Netanyahu allowed Qatar funds to flow to Hamas.